The upper had an incredible, glove-like fit, commented a buyer. A runner liked how the shoe provided warmth during chilly days. A few users agreed that the Alphabounce 5.8 Zip was a comfortable shoe. Some consumers approved the shoe’s use of recycled materials. The shoe was great for street running, wrote a couple of testers. Some buyers were disappointed with the narrow fit of the Alphabounce 5.8 Zip. Several customers stated the Alphabounce 5.8 Zip ran small. One runner felt the shoe had no breathing room for the foot. A user complained that the shoe tore down within only one week. A user found the midsole did not flex well during the stride. Although it was a shoe with a well-thought concept, the Alphabounce 5.8 Zip did not seem to deliver the expectations of users, based on the feedback it received. There was a surprising number of criticisms regarding various elements in the shoe’s constructions, as well as issues on fit and sizing. There were, however, a few positive comments about comfort. In summary, Adidas has created many excellent running shoes, but maybe the Alphabounce 5.8 Zip was not one of them, as voiced out by consumers. 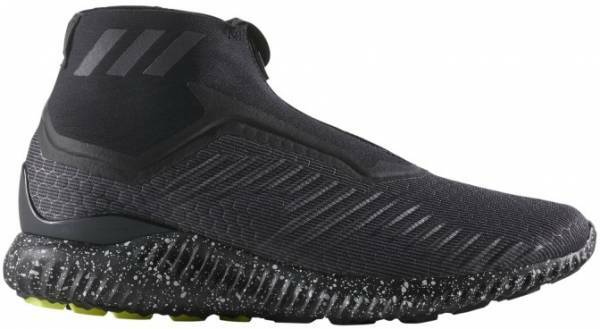 Adidas presents the Alphabounce 5.8 Zip as a lightweight running shoe that targets maximum comfort and support, especially during wintry weather. The name of the shoe is derived from its silhouette and design – a 5/8 collar and a zip-up closure – which are built specifically for winter running. Similar to its base shoe, the Adidas Alphabounce, the Alphabounce 5.8 Zip features FORGEDMESH technology in the upper. In this shoe, the FORGEDMESH upper is “winterized” to remain durable and weather-resistant. The BOUNCE™ cushioning in the midsole enhances the shoe’s comfort and flexibility while also providing the runner with maximum responsiveness. Meanwhile, the Continental™ rubber outsole supplies the shoe with exceptional traction on any surface. The Adidas Alphabounce 5.8 Zip is true to its size and follows standard measurement sizes. The shoe’s moderate construction will fit comfortably on runners with a narrow to moderate foot volume. This shoe is designed for men, and it is available in medium width. This running shoe is equipped with a Continental™ outsole, which is made from the same kind of rubber used in vehicle tires. The result is a durable shoe that has better endurance against wear and tear compared to traditional rubber outsoles. Like a rubber tire, the Continental™ outsole is also capable of gripping any running surface, whether wet or dry. The midsole of the Adidas Alphabounce 5.8 Zip makes use of BOUNCE™, a cushioning material that is more responsive and bouncier compared to standard midsole foams on the market. The concept of BOUNCE™ works during stride: The foam stretches when pressure is applied to it, then springs back into place when pressure is removed. The FORGEDMESH upper offers a seamless fit for a comfortable support. It also stretches effortlessly for an efficient and natural movement. The winterized coating of the upper gives the shoe a water-resistant quality to enable a distraction-free run, even under the rain or snow. It is accompanied by a zipper closure system for the convenience of wear. The 5/8 mid-cut collar is made of Neoprene mesh, to bring to the foot additional comfort and warmth when running in the cold.